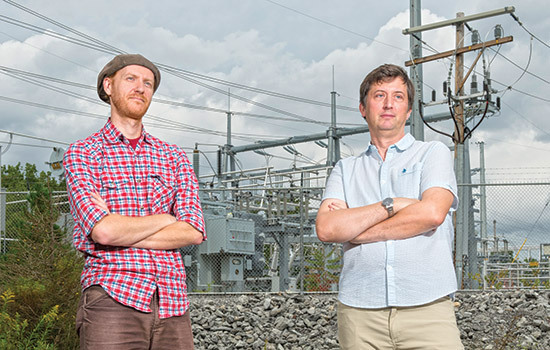 Electricity: A team of RIT researchers led by Eric Hittinger, left, and Eric Williams is developing a new system of algorithmic computer modeling that simulates the future of America's grid infrastructure. RIT researchers are developing a system of algorithmic computer modeling that will help policymakers produce and use electricity more efficiently. The way the U.S. manages its electrical grid has major economic and environmental consequences for the world. The American economy makes hundreds of billions of dollars in annual revenue by generating electricity, but the electricity system also produces massive amounts of greenhouse gases and other air pollutants. A cross-disciplinary team of RIT researchers is determined to help federal and state policymakers find the best way to produce and use America’s electricity, with the goal of simultaneously reducing costs and making the grid more sustainable. The team, led by Eric Williams, associate professor in the Golisano Institute for Sustainability, and Eric Hittinger, assistant professor of public policy, is developing a new system of algorithmic computer modeling that simulates the future of America’s grid infrastructure. The project, funded by a $310,000 grant from the National Science Foundation, started in 2014 and is on pace to be completed next summer. Two graduate students are helping Hittinger and Williams carefully collect and organize data and build the new model: Naga Srujana Goteti, a Ph.D. sustainability student from India; and Rexon Carvalho of India, who is pursuing his master of science in sustainable systems. Policymakers are faced with the difficult task of determining how to use subsidies and tax policies to support emerging renewable energy technologies without knowing how future fuel prices, electricity demand, and technology will change. The long-term nature of these decisions adds to their complexity. Infrastructure investments have locked-in effects that can last for decades and may delay the adoption of new and improved technologies. Existing models such as the U.S. Department of Energy’s National Energy Modeling System (NEMS) use fixed inputs and do not do a good job of accounting for uncertainty, but the RIT researchers are taking a novel approach by building uncertainty directly into their model. “We want to help make decisions that are robust against the whims of politics and changes in the markets,” said Hittinger, co-principal investigator. The RIT researchers are admitting they do not know what variables such as the price of natural gas will be and instead enter a range of possibilities. Although the principal investigators are from different fields, their work together has been a natural fit. “We have similar interests and both look at energy, but we have different skills,” said Williams. “I look at technological progress and Eric (Hittinger) is an expert on electrical systems.” Williams said the two have also bonded over a love of bicycling. Ultimately the researchers are looking for a pragmatic solution to ensuring the world’s environmental health. “We are serious about assessing the economics of the situation and finding solutions that are good for the planet and its people,” said Williams. Once the model is complete, the researchers will host workshops in Washington, D.C., and New York City to present their model to federal and state policymakers.